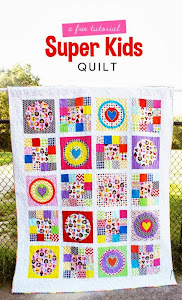 What a fun, bright and cheery quilt! And that IS the perfect background fabric. Your top turned out awesome! 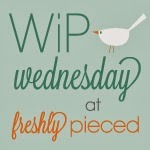 Do you see more paper piecing in your future? Your feathers quilt looks great! I love the solids and the back is perfect! As a side note, thanks to my boys, checking all the dials on my machine is the first thing I do! Hi Laurie! How is the western part of the US treating you? Still creating amazing things I see! The blue background is beautiful and your feathers look perfect! Oh noooo my kids have totally played with my tension too and I don't realize it until way too late! So frustrating. I can't lock them out of the sewing room, so I'm hoping a machine cover will deter small fingers. Your quilt top is gorgeous! I love the solids, they play together so well. Can't wait to see how you quilt it! 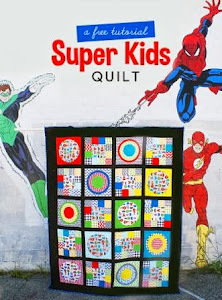 Really awesome quilt! Love your fabric choices - you will do great - cannot wait to see how you quilt it!